Summer involves a lot of activities and one of them is taking one’s bike to the summer holiday. Making sure you get there with your bike in one piece is paramount and this calls for one investing in a quality bike rack. With the many available different bike racks in the market, selecting the best bike rack to satisfy your needs is challenging. Yakima Holdup and Thule T2 bike racks are among the best bike racks in the market with attractive features. However, you may be confused to choose the right one for you. If so, you have come to the right place. In this post we will compare Yakima Holdup and Thule T2 bike racks and guide you with the right one along with the cheapest possible prices listed from various retailers.These racks are also good fit in our Subaru Outback rack selection. Read here for more Thule vs Yakima comparison. Who should Buy Thule T2 Classic? 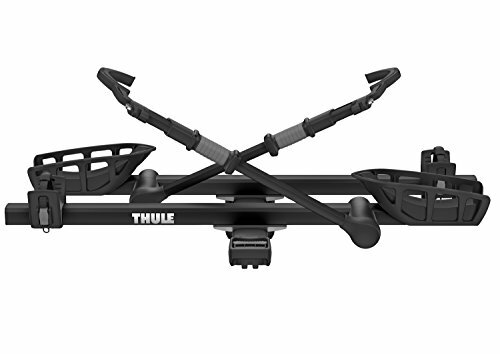 Who should Buy Thule T2 Pro Bike Rack? Who should Buy Yakima Holdup Bike Rack? Thule T2 is one of the best bike racks on the market that comes accompanied with many attractive features that will equally make you want to have this bike rack. To start with, this bike rack is able to carry two of your bikes at the same time thus making your trip simple if you have to carry more than one bike to the trip. It also comes with add-on feature that can help you carry extra two bikes on the rack while driving. While moving along the road you may pass through bumpy roads and you need to know that your bikes are secure even during this time. The Thule company saw to this that they came up with adjustable mount bikes that keep the bikes in their position all through the journey and saves you the worry of having your bikes damaged on the way. Security is one thing that the Thule Company took into consideration when coming up with the Thule T2 classic bike rack. This bike rack includes a hitch pin lock that secures the rack to the receiver hitch. This keeps the rack safe despite the location you are going to. It also has ratcheting arms that are frame free and they make sure the bikes are secured with no contact to the frames. When looking for a product in the market it is important to make sure the product you take is highly durable. 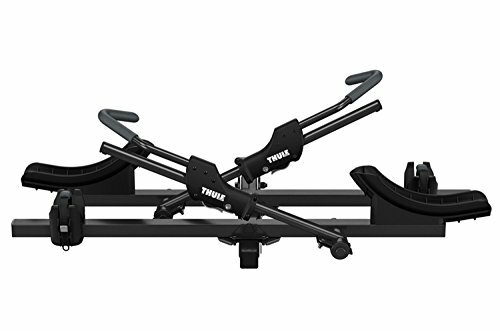 Thule T2 classic bike rack is probably the most durable bike rack in the market. The body is made up of steel and coated with a black paint and has plastic wheel trays that make it water resistant and suitable for all weather. To add on the Thule Company has a warrant plan that covers all the damages and defect that affects the Thule product including damages caused by wear and tear for two years from the date of the item purchase. Its ratcheting arms are small to accommodate the fat bikes. This model of the bike rack is ideal for any individual with a bike that they want to be secure and most ideal for those people looking for quality bike racks and running on a budget. This model has all the quality features and comes with a favorable price. This is another product with outstanding features of the Thule that was refreshed from the T2 version of the bike rack. Reading through many instructions or having to take the bike rack to the garage in order to install is time-consuming. The Thule T2 pro rack has an easy installation procedure that is a one man’s job and involves attaching the hooks to the hitch pin hole. The instructions for assembly of the pieces from the box are well documented. If you need a bike rack that will accommodate all the sizes of the bikes you have then this the bike rack you should go for. The Thule pro rack is designed to accommodate all the bikes in the market today. It can hold up to two bikes and an extension can be pulled to accommodate up to four bikes. It makes your biking trip much fun and enjoyable. Security is another feature that the manufacturer of this bike rack put much effort on. The rack is able to lock securely to the hitch and its cable can extend to the frame and come back to itself where there is a keyed lock. With the individualized lock combination, one need not worry about the security of the bike. Buying a bike rack is like an investment. For this reason, you need a bike rack that will last you for more time. The durability of the bike rack is essential and you need not worry when buying Thule T2 Pro. The external elements of the rack that are moving are made up of durable plastic that is free of rust and corrosion. The main body is made up of steel that keeps it sturdy and water resistant and thus able to use in any weather. Able to carry up to two bikes with an extension that enables it to adjust to up to four bikes. The Thule T2 Pro model is one of the expensive bike racks in the market and is not affordable to purchase if you are tight on budget. This model of the bike carrier is suitable for those people who buy items as investment. It is suitable for those people who prefer to purchase an expensive item that will last for long.It’s also suitable for those people who have several bikes. The Yakima hold up model is the cheaper bike rack for those people running on budget and comes with sufficient features like the expensive bike racks. It has excellent features that will lead you to want to own of this model. Its design is one of the features that you can go for. It’s made in a tilt down design that enables one to be able to access the rear of the car even when loaded with bikes. If you are a family person and you are in need of a bike rack that can accommodate all of your family bikes on the biking trip then this is the bike rack you should automatically go for. Yakima hold up bike rack carries up to two bikes with an extension to four bikes. Another feature that will attract you to buying Yakima hold up bike rack is its security feature. 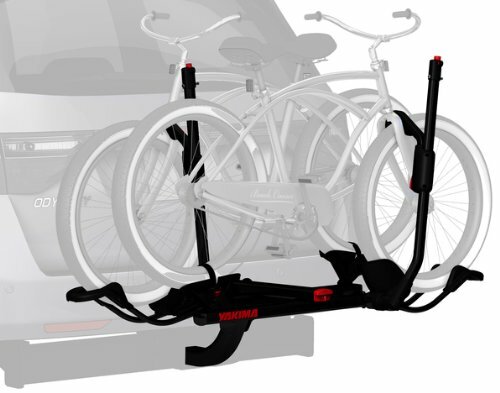 The Yakima hold up bike rack is installed with a built-in lock system that secures your bikes from being stolen. These cables are well hidden in each support arm. It is also made up of wheel straps and strong arm ratcheting that secures the bike at the wheels, protecting its paint enabling you to load the bikes much easier and can be able to accommodate disc brakes, full suspension bikes, and carbon bikes. The hitch pin can be difficult to release when on load. The Yakima Holdup rack model is suitable for those people with several bikes that differ in the styles and weight. It’s also suitable when the roof height is to the extreme. Everyone with a biking interest needs to own a bike rack. There are many bike racks available in the market today. Yakima Hold up and the Thule T2 are among the best hitch bike racks in the market today. They come with suitable water resistant and protective features that enable the durability of the bike rack. To get the value out of your money you need to look at the durability level of the bike carrier you are going to purchase, the security devices installed to them and the materials they are made of. Here we finish Thule T2 vs Yakima Holdup comparison. If you are looking best bike racks for your Prius you may look also into these bike racks selected for Prius.